Most new theology these days is being done by science fiction authors. The re-imagined TV series Battleship Galactica is just one fine example of science fiction tackling religious questions seriously. Many BG fans have noticed that in this futuristic world the expected roles of humanity and machines has been reversed. Here the human colonialists are polytheistic pagans, while the robots are God-believing monotheists. This reversal is deliberate, as Ron Moore, the executive producer makes clear in an insightful interview on Beliefnet. Q: Glen Larson, creator and producer of the first show, is a member of the Church of Latter-day Saints. He based much of the first series on Mormon cosmology. Was there a concerted effort to move away from that in this version? A: At the beginning, I sort of assumed that the Colonials–the human beings–would have a belief system, probably polytheistic. In the original, the “Lords of Kobol” were referred to several times. 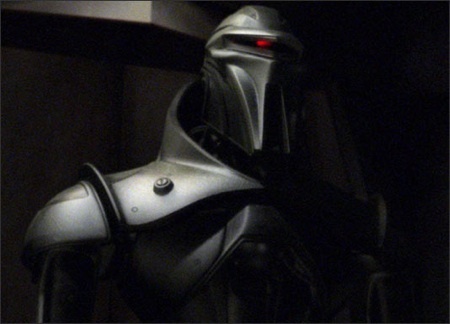 But it wasn’t until the development of the miniseries when I sort of randomly gave the Cylons a belief system. I was creating the characters and working on some lines for Number 6 and I thought it was interesting if she professed a belief in a single God. I had really given her a belief in a singular God almost by accident. I compared that with the polytheistic religion of the colonials, I started to realize that an interesting pattern was developing–the Cylons believing in the one true God and the Colonials having an older, multifaceted system of deities that was obviously patterned on the Romans. As the series went on, I started to believe that the Cylon belief was going to be a guiding principal. Q: People are really noticing the dichotomy between the Pagan and the monotheistic themes. It strongly parallels the rise of Christianity and the demise of paganism in the Western world. A: That’s true. There was a book that I started reading about the one god driving out the many–the rise of monotheism in the Western world and how it came to displace pagan religion. Those themes were interesting to play with in the show: The dynamic whereby the pagan religious practices tended to be tolerant and tended to allow monotheistic beliefs within their own culture. And then there came this came this notion of this outside monotheistic belief, of the one true God that could not tolerate others, that started to drive out pagan worship and that fit very nicely with what we were doing with the show. Because you had this apocalyptic moment of genocide which kicked off the entire series, of this Cylon culture that has this belief system in one god that is literally wiping out this pagan belief system and then is pursuing them across the galaxy. There was a certain resonance in history. Q: Many of the episodes deal with religion very heavily. Why do you think people will watch a sci-fi show that involves a lot of religious themes, but might not watch a “Joan of Arcadia” type show? A: I think it’s like a lot of things in science fiction. People are a lot more comfortable allowing us to go into areas that are controversial or charged. People put in this automatic filter. It’s why the original Star Trek series was able to deal with things like racism in the middle of the 1960’s on primetime television. It’s all pretend and it gives people permission not to get pissed off. Come on! At least get the name of the series right! It’s Battlestar, not Battleship. I only comment on a flaw so small because the blog is so good.